The U.S. Constitution is understandably revered, but there was difficulty getting it approved in a divided, fractious convention of states in 1787, and no one objected to it more than Maryland delegate Luther Martin, described by an admirer as “awkward, coarse, gross, crude and ungrammatical.” Yet his words, delivered at great length, carried weight, as they do today. The great dissenter is lost to memory, writes Bill Kauffman in his book “Forgotten Founder, Drunken Prophet,” and he shouldn’t be. There’s no use trying to whitewash Martin, says Kauffman. Too many spots to be removed. He drank too much and talked too much. When he began a speech, said delegates at the Philadelphia convention, it was time to sleep. 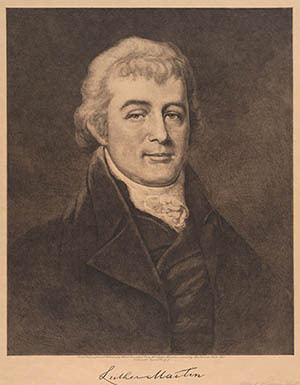 Martin replied that it would have been better for the country “if the whole of that time had been devoted to sleep, or been a blank in our lives, rather than employed in forging its chains.” That was his major objection: a too powerful central government inimical to liberty and prone to intervention at home and abroad. “The Hamiltonians won,” complains Kauffman. The Constitution was theirs and Martin suffered the fate of losers. But Historian Henry Adams, descendant of Constitutionally elected Presidents John and John Quincy Adams, pays tribute to a Martin speech: “Its rugged and sustained force; its strong humor, audacity and dexterity; Its even flow and simple choice of language, its close and compulsive grip of the law.” Summing up, Kauffman says that in response to the famed Federalist Papers supporting the Constitution, Martin provided the best anti-Federalist document, “The Genuine Information,” which, to be sure, doesn’t make school reading lists. Martin wanted the Constitution to abolish the slave trade, arguing in vain that the framers were intent on expanding governmental power except where it could matter most. He warned the Constitution would give Americans an exaggerated sense of mission: “I feel no quixotic desire of proselyting the world to the republic system, no hatred or contempt for those who live under governments of a different form.” Imposing our demands abroad could turn out to be as tyrannical as lopping off heads. “Universally republicanising the world” is a delusion, he insisted. There’s plenty to do at home. And who knows? Martin might have swayed the Convention if it could have foreseen the accumulated power in Washington today: a chief executive who makes wars as he pleases with a vast unelected bureaucracy at his command or commanding him. Even Hamilton would be shocked. Martin didn’t get the Constitution he wanted, but history has been kinder to his views. Given present circumstances, he could even run for office, but please, only one drink.